Our training plan was three months long and had the girls running different kinds of workouts for speed, endurance and hills, four days a week, with cross training on two more, and one rest day. It was a brutally hot summer pretty much everywhere, and so they had a lot of heat and humidity to battle with on a daily basis. As usually happens, one of our girls, Cecilia B. '19, struggled with some previous nagging injuries and after some counseling we decided she should drop out of the training. Another student, Coco Z. '17 was so busy this summer that she had a tough time finding time to train, and so we had her drop out, too, just to be on the safe side. I have worked really hard to acknowledge both of these students within our community. They both worked really hard on this, even if they did not achieve their initial expected outcome. However, both girls did come to the race: one as an official race volunteer, and the other as a spectator who had so much fun, she ended up camping out with us, too. In the end, we did our best to still be one big sweaty and happy running family. I also want to give huge respect for another student athlete, Victoria S. '17, who also started following our team training plan though I did not yet have a spot for her. She liked having a clean calendar with workouts already planned that she didn't have to think about. So, when it came time to make the decision to have Cecilia and Coco sit out the race, I had an extra student trained and ready to go. I also had to step in and run the race. More on that later. 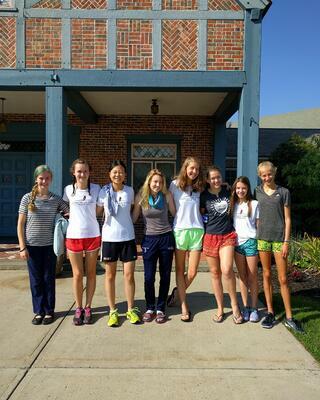 Of the seven girls who ended up competing, only two were cross-country runners on my team. A third loved running so much by the end of the experience that she switched sports to join the cross-country running team. The others play volleyball or soccer, or dance. Two were in 8th grade, three in 9th grade, one in 11th, and one in 12th. Why is this all relevant? 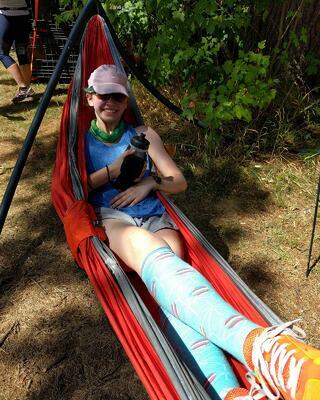 Well, the cool thing about Ragnar trail races is that they are meant for anyone. Any age, any size, any shape, any ability. Despite this, training for this race was a prerequisite for the girls. I did NOT want them injuring themselves just before athletic pre-season began. Race weekend was August 26-27, 2016, a Friday and Saturday. Yes, this race was two days long, meaning it included an overnight. Once it began, someone was out on the trails non-stop, passing the team baton on from person to person until we had all run three times (24 loops) and could finish together as a team. It's a relay race, but what's cool about the trail relays is that all of us get to commiserate and strategize as a team because we are all running the same three loops. The three loops varied in length and difficulty. The green loop was the shortest at 3 miles, and even though it was hilly, all of us agreed it was the easiest loop to run by far. The yellow loop was 4.9 miles, and though it was our middle distance run, the girls and I agree this one was the toughest, as the hills in it were unbelievably relentless and the track itself was the most technical. Finally comes the red loop, clocking in at 7.3 miles of rolling hills and even some old wooden staircases, but also lots of wide grassy paths. This one, though the longest, was everyone's favorite as it left us all with a sense of pride when completed. Even more incredible than the details of the loops themselves is how well trained and enthusiastic the girls were to complete these runs, especially in the dark! 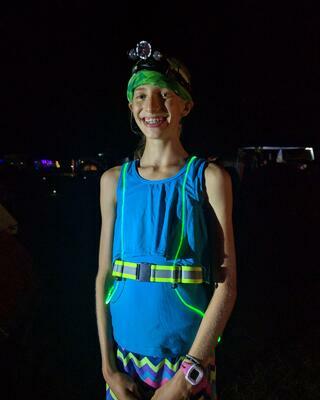 I brought fun LED vests that glowed different colors and we had large headlamps to see the way. Even with hundreds of people competing in this race, you still spent most of your run alone on the trail, and at night this was pretty intimidating. Some of the girls said they saw a mouse run across their feet (me, too!) while they were trucking through their night run. We also heard owls (our school mascot), rustling in the leaves of who knows what (RUN!!!) and in the morning as the sun rose, the sounds of the songbirds was so beautiful. However, all the training in the world was not going to fully prepare us for this race. The trails were steep and very technical (a lot of roots and rocks), and not all of us had access to this all summer. One student lives in Hong Kong and did most of her training on a treadmill, for example. These trails were not for the faint of heart, and the summer heat and August humidity were relentless. The humidity of the two-day event was so high that we remained soaked even overnight. We were basically damp for two days. During the event, I saw people in boots, and being carried away on ambulances. My students saw them, too. Teenagers don't always want to listen to your advice, and as runners they often want to run fast. Thankfully, they listened and our race strategy was slow, steady, and careful. More than that, though, I saw people conquering hills. Leaping with glee over roots, rocks, and fallen trees. Supporting and encouraging perfect strangers. With all of this stacked against us, the girls absolutely loved every minute of it. They would come into the transition area with speed, and pass off the team bib to the next runner and proceed to absolutely gush about all of the awesome things they experienced while they were out on the trail. As the race went on they swapped stories and traded advice for the different loops. They fought exhaustion and walked each other over to each transition to wait for our next runner to come in, and cheer the new one on. That brings me to the rest of the race. When the girls weren't out on the trail, there was plenty to do. We set up a campsite about 1/4-mile from the transition area so that it would be a little quieter, to help us get some rest. We had a beautiful spot, right on the edge of a very tall hill that overlooked the base of Northfield Mountain. We all felt very safe there as the Northfield Police patrolled on foot at all hours. When the girls weren't running, they were lounging around in camp chairs or on the ground in the shade on their sleeping mats, telling each other stories and getting to know each other. Eating and hydrating and eating again. Overnight, most of the girls got a few hours of rest. There was an average of about eight hours in between each run, but exploring the Village (where they had a campfire, a big screen movie, food service, music, merch tent, etc. ), socializing and eating and drinking to refuel took up most of our free time. I slept the least out of everyone, probably closing my eyes for a grand total of 45 minutes if I was lucky. I'd done plenty of these before, but I had never been in charge of seven middle and high school runners, so I felt like I had to be around to make sure they were awake and ready to run on time and that nobody had to go to the transition area alone. But honestly, these girls didn't really need me. Yes, some of them were young, but they were so enthusiastic about this entire experience that they hung on every word I said and actually LISTENED and REMEMBERED how to do things, even though this was their first event like this. Even when I forgot to warn them of things, they were all over it. They were waking themselves up and getting ready for their runs on time. They were walking with tired teammates to go get dinner when they noticed they weren't enjoying our typical camp food. They were upbeat and smiley. They never complained even once. I was completely surprised and delighted at their maturity and preparedness for this event. I had high hopes for this weekend, and the students far surpassed every single one of them. I couldn't have done this race without the help of two other faculty volunteers, Charlotte Hogan and Meghan Lena. Without them, I would have gotten zero sleep and could not have had the time to wander around visiting other teams full of local runners I train with on a regular basis. Coach Tim McCall was around, too, but he actually competed with another team so we didn't see much of him as he was busy doing the same types of things with his other team. I also had a lot of very helpful parents come visit who helped keep our spirits up, cheered for us, and helped us break the campsite down. Sandy Hodges traveled all the way from Hong Kong with her daughter to witness this event, and she was incredibly supportive during the entire process. Michelle Brynda came by a few times on race weekend to check up on us, and lent a big hand when it came time to pack up and move out. Alyson Montgomery stopped by to check in on her daughter, and ended up giving us a lot of great advice about running Northfield Mountain, as she used to race there when she was a student on her school's cross country team. Neal Katz also came by to watch his daughter take off on her night run and to hang around camp to get a sense of this crazy race she signed up for. They also all came back, in addition to Michelle Rooks, to watch our team meet up with our last runner, Victoria '17, and travel across the finish line together as one big happy team. Twenty eight hours, 42 minutes and 29 seconds after our first runner took off from the starting line, we finished as a team. I want to leave you with some statistics from this race. Eight runners all ran three loops (green, yellow, and red) for a combined total mileage of 15.2 miles and 2,887 vertical feet of climbing. That's a team total of 121.6 miles and 23,096 feet of vertical climbing. The team finished first in its division of female high school teams, and placed 96th out of 133 teams, beating the times of 37 adult teams. That's incredible. My girls are already talking about a new witty team name for next year, and how they need way more decorations for our tents. This race was challenging in so many ways, but it was also inspiring. Only time will tell, but I firmly believe it has made some lifelong runners out of the girls. Every single student on this team (including our volunteers) is already planning to come back to tackle those trails again. If not next year and in New England, then in college with new friends. And beyond. These girls made me so proud, they brought me to tears. I am in awe of how strong and beautiful they all are, and am so excited for what lies in their futures. Not all of them were runners when they signed up for this race. But each one of them can call themselves that now. Each and every one has told me how strong they have felt within their individual sports, and how happy they were they took a chance to try something new and push themselves way beyond their comfort zone. As a teacher entering her 11th year of teaching, this was the inspiration I needed to get out of summer mode and ready for a new year. Something is changing at this school, and in a good way. Our girls are braver than ever. They are trying new things, and seeing that in risk comes reward. I like where we're headed, and I can't wait to see what comes next. Congratulations to the runners and a thousand thanks to their families who lent us their daughters all summer to train for and compete in this race.